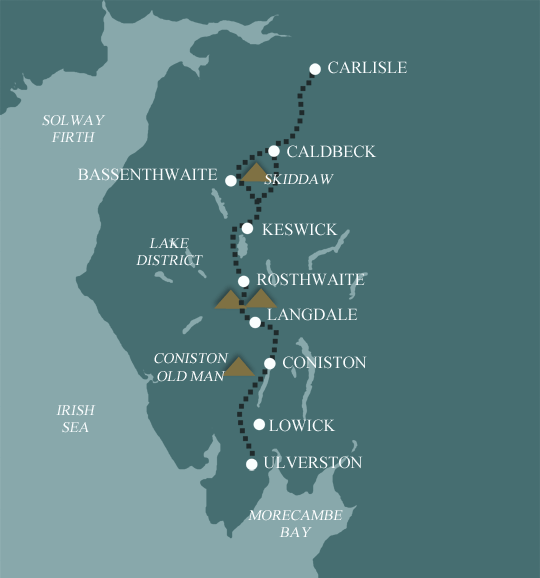 We have three different options for the whole of the Cumbria Way path - choose from 6, 7 or 9 days walking, depending on how far you want to go each day. This is our shortest holiday covering the whole of the Cumbria Way route. It is perfectly achievable by fit walkers used to longer days, but does involve 2 long days from Langdale to Keswick and Keswick to Caldbeck – a total of 16 miles including the mountainous section around Stakes Pass. If you have more time, the 7 day option breaks this section at Rosthwaite. The route starts at Ulverston, a market town on the southern edge of the Lake District. It then passes through rolling farmland north of Ulverston before reaching open bracken covered moorland and foothills around Blawith. 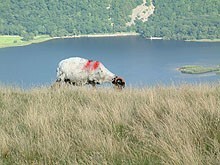 It then descends to the lakeshore of Coniston Water which it follows to the village of Coniston. The route continues on green lanes and wooded paths to Tarn Hows, one of the celebrated features of the Lakes. More woods and moorland lead to the Lakeland village of Elterwater, before the path enters the Langdale Valley. Overshadowed by the dramatic high crags of the Langdale Pikes and Bowfell, this is perhaps the most famous place in the Lakes. A steep climb up Stakes Pass at the head of Langdale leads down to the long and remote valley of Langstrath, punctuated through its length by deep pools and waterfalls. The route continues through the densely wooded Borrowdale Valley, before passing over the slopes of Cat Bells, above Derwentwater and on to Keswick, a bustling tourist town and the hub of the Northern Lake District. Paths meander through rougher, open moorland and mountain sides leading onwards from Keswick and over the slopes of Skiddaw before descending to the village of Caldbeck at the foot of the northern Fells. The final day is a contrast to all that has gone before – gentler, rolling countryside takes over as the path follows the meandering River Caldew downstream to the historic border city of Carlisle, and the end of the trail. The Cumbria Way uses well defined and maintained paths and tracks over nearly all of its route. Please bear in mind that the climb over Stake Pass, and the Eastern route around the back of Skiddaw, pass through relatively high and remote mountain terrain, where the paths are rougher. Although some of the route is waymarked, these sections are not, so the ability to navigate is essential. You need some walking experience to do this route. Terrain: Most of the walk follows valleys and lakeshores, but the climb over Stake Pass and the Eastern route around Skiddaw pass through relatively high and remote mountain terrain, where the paths are rougher. What’s it like underfoot? On the whole the paths are well defined and maintained, but at times it can be rough underfoot with some muddy paths, so good footwear is essential. The Western route around Skiddaw to Caldbeck can be boggy. How Much Up & Down? Most days are rolling with gentle ascent and descents. The climb of Stake Pass is about 300m, on a well maintained path. Between Keswick and Caldbeck the Western route has a climb of about 300m, again on good, but sometimes boggy paths. The Eastern route has a further 300m climb taking you up to 658m on High Pike, on less well defined paths. Signposting: Sporadic. You will need to use your guidebook and map. Navigation: Pretty straightforward, on the lowland sections, but you may encounter hill fog or low cloud on Stake Pass and between Keswick and Caldbeck – so you need to be able to navigate. Weather: You may be lucky enough to encounter warm, dry weather over the whole route and enjoy dry paths and tremendous views, but you must be prepared because the weather can change quickly. Good clothing and waterproofs are essential! Accommodation Overnight Bed and Breakfast accommodation in selected hotels, farmhouses, village inns, guest houses and family B&Bs.Full English or Continental breakfast. Guidebook A detailed guidebook with route information, maps, photos and background information. Information of Services Along the Route A comprehensive Service Info sheet, including services such as cash points, banks, post offices, village shops, inns, cafes and taxis. Maps A waterproof 1:40000 map from Harvey Maps covering the whole route. Personal Itinerary A personal itinerary setting out each overnight stop, including large scale maps of each accommodation, to ensure you find it easily. Emergency Telephone Support If you get in to difficulties during your holiday, we are always available to help, even out of office hours. 15% discount at Cotswold Outdoors We will issue you with a 15% Discount Card valid at all Cotswold Outdoor stores, and online, for the whole year on confirmation of your booking. Luggage Transport We will transfer your luggage between each overnight stop – if you leave your luggage at the accommodation when you set off in the morning, it will be moved on to your next B&B. You only need to carry a small day sack with the clothes and provisions you require during the day’s walk. Provided for each day’s walking and recommended on this holiday as there will not always be a handy shop or cafe on the route. Off Road Parking If you are travelling by car we can usually arrange off road parking for the duration of your trip. (There may be a small charge for this). Arrangement of return transport We can also arrange your transfer back to your car, (or advise you when public transport is a better option)! Evening Meals Your evening meal isn’t included in the package, but we include full details and recommendations for each evening meal in your itinerary. You will normally be within walking distance of a pub and/or restaurant, or where there is good food available at the accommodation, we’ll book that for you. Allow about £20.00 per night. Transport to the Start & Away from the Finish Have a look at the “Travel Info” tab above for suggestions. If you’re still struggling, get in touch and we’ll help you sort it out. Travel Insurance Even if you are based in the UK travel insurance is worth having. One of the great features of our Cumbria Way holidays is the quality of the accommodation, including small country house hotels, guest houses, bed and breakfasts and farm house accommodation. In selecting the accommodation we look for helpful, friendly hosts with good quality, characterful accommodation close to the trail. We always try to arrange en suite accommodation, i.e. rooms with their own bathrooms for each night of your stay. However, in some of the more remote locations accommodation is limited and occasionally we may have to book rooms with shared bathrooms for one or two nights of your holiday, (especially if the booking is made at short notice), but we will always let you know if this is likely to be the case. Single Rooms We are happy to book single rooms on this walk but cannot normally book more than 2 for any one group. Single room bookings include a supplement. 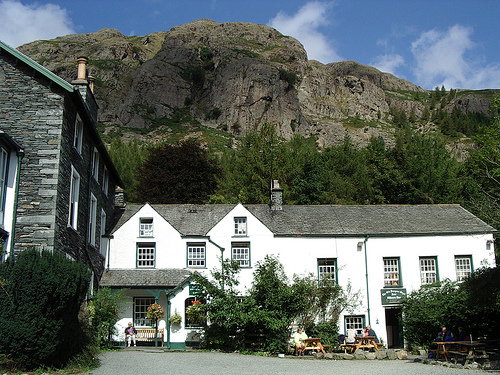 The Langstrath County Hotel is set in the Lakeland village of Stonethwaite. It is a small local family run haven for walkers and lovers of the countryside. It was built around 1590 as a miners cottage and is now a quality hotel offering comfortable bedrooms and excellent service.The restaurant serves excellent, quality Lakeland dishes using the finest local ingredients. 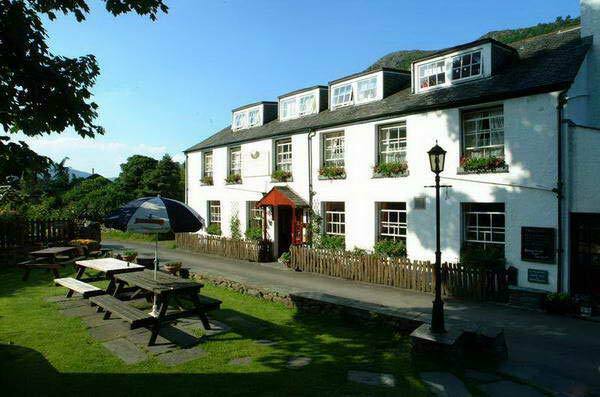 Conveniently located at the centre of Keswick, The Ravensworth is a quiet and comfortable hotel that offers a high standard of accommodation and service. Jason and Alison will give you a warm welcome and are used to walkers with muddy feet! You can be sure of an excellent hearty walkers breakfast here. You can guarantee a great service and hospitality at the ODG, as its known locally. It is in an excellent location at the heart of the Langdale Valley, with superb views. The bedrooms are warm and cosy and many walkers appreciate the vast array of beers available in the quirky Walkers Bar. General travel information on the Cumbria Way area will be in your holiday pack including train and bus timetables where available. Detailed instructions on getting to your first night’s accommodation by car, or on foot from the nearest train or bus station, will also be included in the holiday pack on individual accommodation maps. If you require secure car parking whilst walking this route, please contact us for detailed information – we can usually arrange car parking either at the start or end locations of the route. By Air: The nearest international airport is Manchester (MAN) – you can travel direct by train to Ulverston (ULV) which takes approximately 2 hours. By Public Transport: There is a direct train from Manchester (MAN) to Ulverston (ULV). There are also regular trains from Glasgow, London, Lancaster or Preston. National Express Coaches run to Windermere where you can then take a local bus to Ulverston. 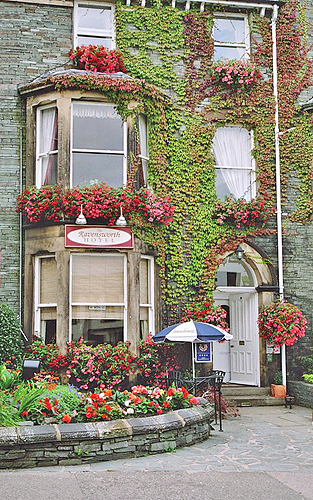 By Road: Ulverston is situated in the south of the Lake District National Park. The closest motorway to the village is the M6. By Public Transport: Carlisle has a large railway station for regular train services north and south on the west coast mainline. By Road: There are many main roads running past Carlisle. The M6 is the closest motorway. A pleasant Lakeland Village on the shores of Lake Coniston. Take a cruise on the lake on the steam launch “Gondola”. Visit historic Brantwood, nineteenth century home of John Ruskin. For the more energetic, Coniston Old Man is a great walk with tremendous views over the Lake District and Morecambe Bay. Keswick is a bustling market town centred around the historic Moot Hall, with a vast array of outdoor shops – if you need any outdoor gear, you will get it here! There is a wide choice of places to eat or have a coffee, and a range of galleries to visit. Enjoy one of the easy, short walks down to the lakeshore from where there is a regular launch service around Derwentwater. Or pop into our offices to say hello or book your next holiday! Carlisle is an historic border city, complete with castle and cathedral. Tullie House Museum has a lot of Roman artefacts and is worth a visit. The cathedral was founded in 1122 and is open every day. The castle has dominated the city for 9 centuries, and also houses a military museum – there are guided tours daily. There are plenty of shops and lots of places to eat or have coffee. Explore the very heart of the Lakes, with striking views of Lakeland's high fells. 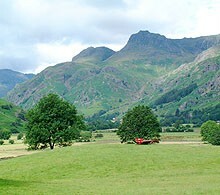 Some great valley walking too - through Langdale and Borrowdale, the most famous Cumbrian Valleys. Walk under the craggy Langdale Pikes and along the shores of Derwentwater and Coniston water.